The ear is an advanced and very sensitive organ of the human body. The major task of the ear is to detect and analyze noises. Another very important function is to maintain the sense of balance. The ear is divided into three different parts: the outer ear, the middle ear and the inner ear. The only visible part of the ear is the pinna (the auricle) which — with its special helical shape — is the first part of the ear that reacts with sound. The pinna acts as a kind of funnel which assists in directing the sound further into the ear. Without this funnel the sound waves would take a more direct route into the auditory canal. This would be both difficult and wasteful as much of the sound would be lost making it harder to hear and understand the sounds. Once the sound waves have passed the pinna, they move two to three centimeters into the auditory canal before hitting the eardrum. The eardrum (tympanic membrane), which marks the beginning of the middle ear, is extremely sensitive. In order to protect the eardrum, the auditory canal is slightly curved making it more difficult for unwanted objects to reach the eardrum. At the same time, earwax (cerumen) in the auditory canal also helps to keep unwanted materials like dirt and dust out of the ear. In addition to protecting the eardrum, the auditory canal also functions as a natural hearing aid which automatically amplifies low and less penetrating sounds of the human voice. In this way the ear compensates for some of the weaknesses of the human voice, and makes it easier to hear and understand ordinary conversation. Once the vibrations of the eardrum have been transmitted to the oval window, the sound waves continue their journey into the inner ear. 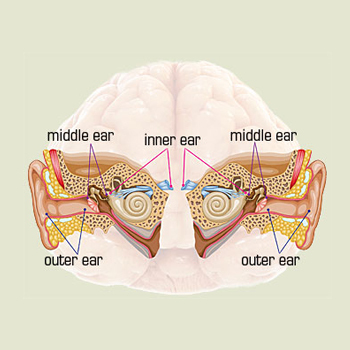 The inner ear is a maze of tubes and passages, referred to as the labyrinth. In the labyrinth can be found the vestibular and the cochlea. In the cochlea, sound waves are transformed into electrical impulses which are sent on to the brain. The brain then translates the impulses into sounds that we know and understand. When the fluid moves inside the cochlea, thousands of microscopic hair fibers inside the partition wall are put into motion. There are approximately 24,000 of these hair fibers, arranged in four long rows. The hair fibers are all connected to the auditory nerve and, depending on the nature of the movements in the cochlear fluid, different hair fibers are put into motion. When the hair fibers move they send electrical signals to the auditory nerve which is connected to the auditory center of the brain. In the brain the electrical impulses are translated into sounds which we recognize and understand. As a consequence, these hair fibers are essential to our hearing ability. Should these hair fibers become damaged, then our hearing ability deteriorates.